The OMB-DBK42 sixteen-slot OM5 signal conditioning module allows OMEGA’s OMB-LOGBOOK or OMB-DAQBOARD-2000 Series data acquisition systems to accom-modate any combination of up to sixteen OM5 input signal conditioning modules*. Each user-installable signal conditioning module offers 500 V isolation from the system and from other channels. 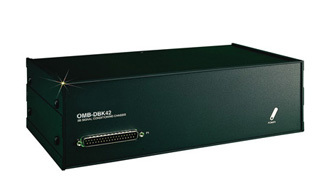 A single cable connects the OMB-DBK42’s output to your data acquisition device. One OMB-LOGBOOK or OMB-DAQBOARD-2000 Series module can support up to sixteen OMB-DBK42 units, providing a total of 256 isolated analog input channels. The OMB-DBK42 can obtain its input power from a number of sources: an included AC adaptor, an optional OMB-DBK30A rechargeable battery/ excitation module, or directly from a 12 Vdc source, such as an automobile battery. The OMB-DBK42 has a built-in DC/DC converter capable of powering a full complement of OM5 modules even when the unit is fully outfitted with strain gage modules with bridge excitation on every channel. The optional OMB-CN-71 and OMB-CN-72 signal connection blocks provide a convenient way of connecting analog signals to the OMB-DBK42. The OMB-CN-71 connection block is for non-thermocouple applications, while the OMB-CN-72, which features cold-junction sensors, is for thermocouple applications. Each block contains 4 terminals per channel, providing access to both the OM5 modules’ input and excitation output features.